This is my go-to breakfast during the week… Takes about 10 minutes to make, during which time I put together my big bucket of salad and servings of turkey for my at-work meals. It’s the happy result of an experiment from when I was in my super-strict Zoned Paleo phase, and it tastes just like a juicy, delicious hamburger. This couldn’t be easier… just drop your ground beef in a saute pan on medium heat and begin to brown, stirring periodically to avoid burning. 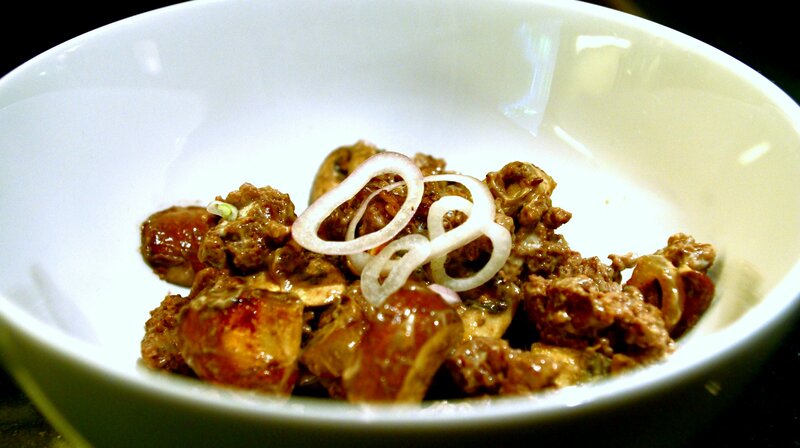 About halfway through cooking, add in the mushrooms and onions… continue to brown and stir. Once the meat is fully browned and your mushrooms and onions are cooked, transfer everything to a mixing bowl, add the mayo, and stir until everything is lightly coated. Serve immediately or pop into a tupperware container to take to work (like me!). The protein and fat content in this yummy breakfast will keep you going all morning! I think this looks yummy. I have been doing Paleo research for a while, and am moving in that direction. Love your blog and recipes, THANK YOU!! We have been eating a “Paleo life-style” for three years…. this is my breakfast most mornings:) You are right- it gets you through the morning. As a RN, I work 12 hr shifts and don’t have much time in the morning to cook. Some mornings I’ll add homemade salsa or pre-cooked veggies left over from dinner….Keep up the great work! Love your website! !